For every bloggers intention is to increase the google crawl rate.If your crawl rate will increase then it will also increase the visitors of your site. Managing a site is not so easy you have to work a lot for it.You have to make posts,you have to engage with social media also you have to make communication with your readers. Also you have to do SEO for your site. So in today's post I am going to tell you about the tips of how to increase the google crawl rate of your website or blog. It is very important to publish post daily to your blog.If you update your site daily then google bot will visit your site daily and will crawl your site regularly. So make sure you are posting daily 1 or 2 post to your site. Posting unique content is another way for increasing crawl rate of a website. 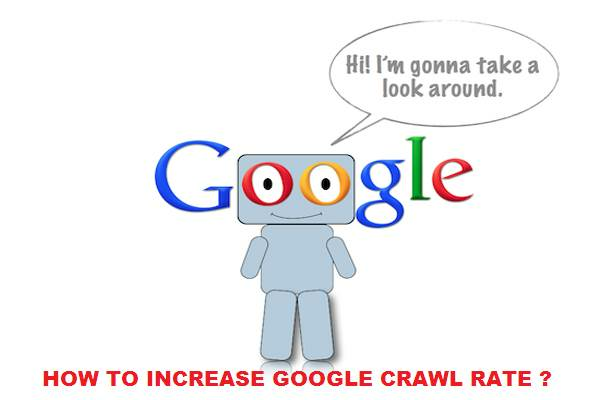 If you post unique content regularly then google crawler will visit your site after every 5 seconds. So keep posting unique contents on your site. It is a very important thing. If you submit your site to search engines than you will get more visitors from Search engines. Don't copy others posts on your site.If you copy others content to your site then you will be penalised from search engines. So make your unique content and ignore copy pasting. If your site takes too much times for loading then it is a very bad thing. So make sure of using small kb images and videos on your site.If your blog take too much time then google crawler will take more times to crawl your site also sometimes it will just ignore your site. There may be some pages on your site which is not needed to crawl by Google such as level page.You can ignore those pages by robot.txt files. You can monitor your crawl rate by using Google webmaster tools.So that it will be easy for you to monitor the crawl rate and you can work as needed. Google search crawlers first see the title and meta tags.So make a title and meta tags wisely. In present search engines gives much importance to images.You can get good traffics from search engines by optimizing your images.Also if you optimize your images then it will be more beneficial for crawler. It a part of internal seo.If you use schema.org markup language to your site then search engines will easily understand the position of your site. From now google gives much more priority to mobile friendly sites.Now a days people use mobile rather than desktops.So make your site mobile friendly and make your site high ranking on search engines. Many webmasters are giving priority for using videos on a post.They are saying that your post will get more importance in search engines if you use a video on your post. If you follow those things properly than your site's crawl rate will increase surely. And if it is increased than you will get much more visitors also your site's ranking will increase. Forex Trendy is a sophisticated program capable of finding the safest continuation chart patterns. It scans through all the forex pairs, on all time frames and analyzes every prospective breakout.